has a new drama offering titled, Starla which makes her excited as well as her fans. The 40-year-old actress also shared that they have already started taping for the project. “It’s being handled by Onat Diaz and Darnel Villaflor. I still don’t know with ABS when it will be shown, but I’m certain it’ll be this year. I’m just happy that at this point, we’re able to save episodes. At least, we have ample time to polish everything to ensure quality entertainment for the viewers,” says Judy Ann. It’s been six years since she acted on a soap. Didn’t she have jitters when taping for Starla commenced? “During the initial taping days, I was adjusting given that I haven’t made a soap for a considerable length of time. I’m used to the previous scenario when as one of your shows is about to end, a new one is making its pilot telecast. After six years, I’ve realized a lot has changed already,” she admits. “For one, the lights are different now—they’re smaller, thinner and not that hot. Even the cameras, they’re smaller and portable. They can be changed from one position to another without exerting so much effort. Truly, doing a ‘tele-serye’ these days is like doing a full-length film. Everything is more organized,” she adds. The award-winning star admits that her character in her new soap is not that easy to portray. 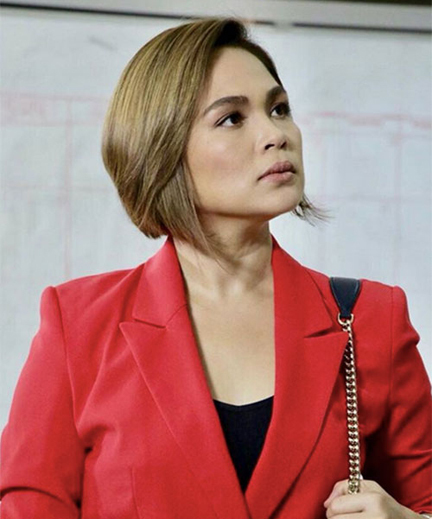 Despite that challenges, Judy Ann still enjoys the role. It’s something different from her usual oppressed characters. “I have to look and make the role believable as a strong, rich and sophisticated lady lawyer. I always wear make-up in every scene and my hair is always fixed. I don’t know what the people’s reception would be. But I believe in the material. It holds a lot of promise. It teaches lots of values. I’m quite sure the viewers will like it,” ends Juday. After admitting that they’re currently dating exclusively, Arjo Atayde dismisses the thought of working with Maine Mendoza on screen once again. They were last seen together in the hit 2018 Metro Manila Film Festival entry Jack Em Popoy: The Puliscredibles. “I want our relationship to be on the personal level. Honestly, I never thought of working with her soon on the big or small screen. As I’ve said, ours is on a personal level and not a showbiz thing. It’s different,” he avers. Both of them are actors so it’s not really impossible if in the future they get the chance to work together again in one project. It’s no secret that he has lots of bashers who question his intentions for Maine and even accuse him of just using the phenomenal star just to become popular. “For the record, I’m not using Maine. If they question whatever we have right now, then it’s not my problem anymore. Whatever they say will not affect me at all. I will just keep working. I never really dreamt of becoming a superstar. I just wanted to act, that’s all!” ends Arjo.